Ten Speed Press, 9781607746379, 296pp. 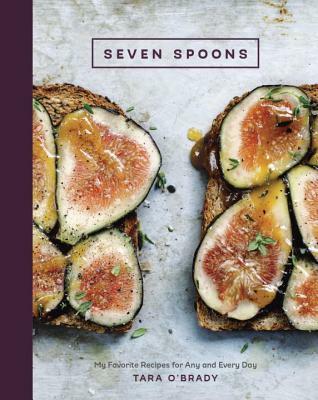 The much-anticipated debut from the author behind the popular food blog Seven Spoons, featuring distinctive, crowd-pleasing recipes; engaging, writerly essays; and the same stunning photography that has earned her website a devoted following. Tara O'Brady was one of the earliest food bloggers to enter the scene, and now, more than ten years after she first started Seven Spoons, she has become one of the most highly regarded and unique voices in the culinary arena. In her debut cookbook, Seven Spoons, O'Brady shares stories and recipes from her Canadian home--fresh, ingredient-driven food that is easy to make yet refined. Recipes like Roasted Carrots with Dukkah and Harissa Mayonnaise, Braised Beef Short Ribs with Gremolata, and Plum Macaroon Cake are wholesome, hearty, and showcase the myriad culinary influences at work in O'Brady's kitchen. Her evocative writing and gorgeously simple, elegant photography has earned her accolades from Saveur magazine, the Daily Mail, and more. Impeccable food photography and a lavish package round out this beautiful, personal collection. TARA O'BRADY is the author of Seven Spoons, a food blog she started in 2005. She lives in Southern Ontario, Canada, and is married with two sons. She has a regular column in Uppercase magazine and appears periodically in the wildly popular quarterly Kinfolk. She has written for or worked with the Globe and Mail, BonAppetit.com, Saveur.com, PBS.com, Parenting.com, StyleAtHome.com, Design*Sponge, Oprah.com, and more. "This crackling debut effort by the popular recipe blogger and Globe columnist is one of the first Canadian cookbooks to convincingly capture the openness and internationalism of how so many of us eat...A thrill to cook from and to read." "It's not just that the recipes are unique, but she writes head notes and directions more beautifully and thorough than any I've seen." "What [is] most extraordinary, though, was how fluidly she [moves] between culinary cultures; if a cuisine is a language, she [speaks] a dozen of them, nailing their grammar, vocabulary, idioms and syntax. Seven Spoons is superb and stirring…one of the first cookbooks I know that convincingly captures the openness and internationalism of how so many Canadians eat today." "O’Brady has a knack for making her recipes seem completely familiar while imparting a unique twist to each… Seven Spoons [is] one of our favorite cookbooks of the year. "A collection of every day recipes with just a little bit extra." "Seven Spoons is teeming with just the kind of inspiration we all need ... The recipes are inspiring in a very specific, homespun way, clearly the product of years of honed repetition at a family table."